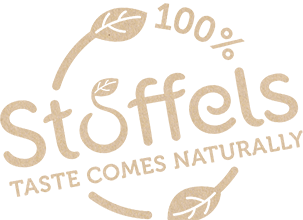 We aim for 100% taste, 100% natural, 100% Stoffels! Stoffels Tomato Nursery was first founded more than 20 years ago and has grown today into one of the most modern tomato production companies in Belgium. Our tomatoes are currently grown on a surface area of 30 hectares, half of which is illuminated. Our company has a clear and easily identifiable profile. In recent years, we have maintained an innovative approach to sustainable tomato production. We work with passion and determination, pushing out our boundaries every day, so that we can create new standards and improve current ones. Our core priorities of originality and innovation are an irrevocable part of our DNA. Taste is everything! A delicious product is the best guarantee of a repeat purchase. This is why the Stoffels taste team is constantly looking for new varieties so that they can create unique assortments. The varieties are selected for their impeccable quality and their unique and lasting taste. In addition to our range designed for taste-conscious consumers, we also seek out special varieties of tomatoes for chief-cooks to allow them to create dishes that guarantee their unique profile. Choosing the right variety is very important in order to guarantee this. The taste team embarks on its quest for new varieties several times each year. New varieties and new trends undergo thorough testing in the greenhouses: production capacity, resistance and shelf-life are all carefully studied and analysed. Taste remains the most decisive factor when it comes to retaining a variety. Tomatoes have to be delicious. This is why our tomatoes are not harvested until they have reached a peak stage of ripeness on the plant. Pick the best! Ultra-fresh and ripe. Thanks to the strict selection procedure for choosing varieties and the freshness of the tomatoes we supply, we are able to guarantee lasting and stable flavour and appearance. Our secret: playing very close to the ball and harvesting after receiving orders. All our products and processes meet certified quality standards. So that consumers are always guaranteed optimal food safety. The Vegaplan Standard includes specifications that guarantee the quality of fresh vegetables. The Vegaplan Standard guarantees food safety, traceability, technological quality and sustainability. Global G.A.P. is the internationally renowned standard for agricultural production. This standard applies to food safety, traceability, the environment, well-being on the shop floor and sustainability. The IFS Food Standard guarantees food safety, quality processes and products. The QS – trademark stands for certified quality guarantee for food – from the production company to retail outlets. GRASP stands for Global G.A.P. risk assessment on social practice with a specific focus on employees, health, safety and well-being at work. Stoffels is also a member of Sedex, that campaigns for improvements in ethical and responsible enterprise in the worldwide food chain. Our mission at Stoffels is to provide our clients and partners inspiration thanks to our valuable innovations. Not only do we seek originality in our choice of new varieties of tomato, but also in the creation of new packaging and marketing concepts. In our new Toma’ line, you will find strong brands that are a perfect reflection of the Stoffels label. The Automato offers the solution to a number of issues raised by the retail sector and, at the same time, offers consumers a unique in-store experience! Product innovation is important. Seeking out new varieties and sales concepts has become a core task within the company. A tomato is not just a tomato, but a fruit that attracts consumers, thanks to its shape, size and colour. We are constantly looking for varieties that guarantee us an exclusive position. We are the only company to produce these varieties of tomatoes in Belgium. This increases our marketing opportunities and makes it easier to seal deals with retail outlets. Always looking for new trends! We never take our eye of the needs of end consumers when creating new packaging with a clear sales concept. A well-designed pack immediately suggests the different ways of consuming the product. The self-service option in supermarkets and greengrocers is gaining in popularity. 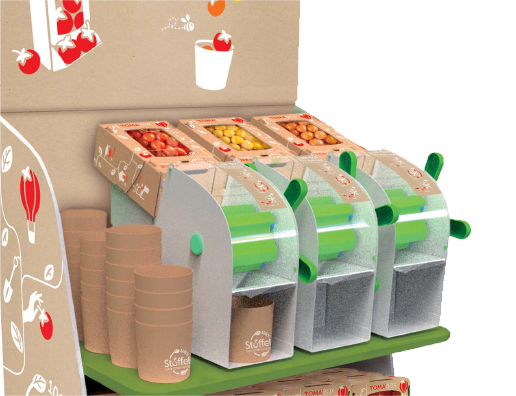 The Automato guarantees customers a hygienic and fun way of choosing the quantity and the specific colours of the cherry tomatoes they want. The colourful presentation of the tomatoes and the option of choice is a major attraction for both young and older consumers. Stoffels feels strongly about people and about the environment. It is one of the pioneers of sustainable energy consumption. The company is also a leader in the economic consumption of water, crop protection and fertilisers. We treat our staff, our clients and consumers with respect. Only by following this policy are we able to succeed in offering fully sustainable products in the stores. We consider caring for the environment to be essential. This is why we use organic products where possible, in order to combat mould, disease and insects. All our products are ready-to-eat. That means you can eat them without rinsing. At Stoffels we aim to become a residue-free company. Our greenhouses collect as much rain water as possible. By recycling 100% of our drainwater, none of the water escapes to water courses or into nature. Employees are the human capital of all companies and the success of these companies depends entirely on adopting an effective HR policy. Here at Stoffels we make significant investments in coaching, training and helping our employees. This results in motivated employees and a diversity among individuals. Stoffels is a certified WISE (Work Integration Social Enterprise) and, as such, we declare our willingness to guarantee sustainable employment for disadvantaged people. Our waste is transformed into compost, according to the “cradle to cradle” principle. All our crops are grown in coconut fibre, a waste product from the coconut industry. After it has served its principal purpose, it is recycled in the tree nursery. All residue from crops is turned into compost and even used packaging is recyclable. A heat-exchange system produces the energy for heating the greenhouses. Gas engines are cooled with water, which is then used to heat the greenhouses. The released exhaust fumes are cleaned. The CO2 emissions are consumed by the plants and transformed into oxygen. The electricity produced is transferred to the grid. We avoid the use of plastic when possible and focus on renewable raw materials for our packagings. We also work hard on a clear end-of-life story. According to our reduce-reuse-recycle principle, packaging must be recyclable or compostable. We strengthen our message by actively searching for recognised certification.